Laboratory thermometers to control temperature and make measurements as good as possible. Platinum sensors thermometers to research institutions and laboratories. Laboratories and all kinds of research institutions shout be equipped with lasting and accurate thermometers. To meet our customers needs termoprodukt as manufacturer offer wide range of precision RTD calibrated digital thermometers. To control temperature and make measurements as good as possible in our offer customers can find digital thermometers with platinum sensors and resolution 0.01°C. 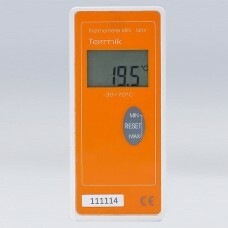 Pocket digital thermometer DT-11 with 0.01°C resolution, accuracy 0.05°C, fast response cca 5 sec. I..
Pocket digital PT-1000 probe thermometer DT-2 with 0.01°C resolution, accuracy 0.07°C can ..
Low cost digital store transport LCD thermometer with internal sensor Termik measures temperature ov..
Pocket digital PT-1000 probe thermometer DT-2 with 0.01°C resolution, accuracy 0.07°C can be used in.. Accuracy 0.1°C. Response time less than 5 sec. Precision food processing cooking laboratory digital ..
Quick measurements thermometer with response time less than 5 sec and accuracy 0.1°C. Calibrated HAC..
Multifunction 0.01°C resolution temperature meter. High accuracy food laboratory digital thermometer..
Agriculture labs food digital probe thermometer DT-34 measures temperature over the range of -50°C t..
Fast response - less then 5 sec. Accuracy 0.1°C. Food industry digital probe thermometer DT-34.. Precision platinum resistance PT-100 laboratory industrial probe digital thermometer 100-TP measures..